Nowadays, photogrammetry is extensively used in movie production, as it helps create convincing visual effects, bring real environment to the movie, and blur the lines between what is real and what is not. The production team of the new Ghost in the Shell movie, starring Scarlett Johansson, decided to use photogrammetry as well, because they wanted to record actors’ performances in-camera and did not want the movie to be dominated by greenscreen process work. If you have already seen Ghost in the Shell, you have seen the “solograms” of people within the streets of futuristic Hong Kong. These “solograms” appear throughout the film’s cityscapes and are meant to represent futuristic commercials. Forget traditional 2D billboards, these moving 3D elements are the ads of the future. Here you can watch the official trailer. 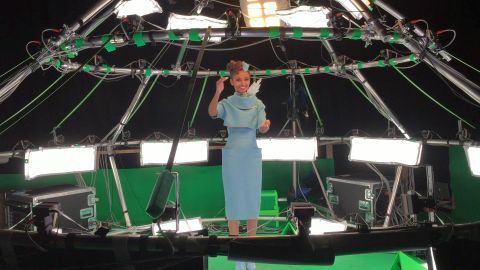 In order to create these “solograms”, Digital Air Inc, VFX and camera-array-technology company, created a special “motion photogrammetry” camera system for the production. It is a dome that consists of 80 Point Grey Grasshopper cameras. These cameras have an auto synchronization feature, meaning that the timing of shutters of all the cameras are perfectly synchronized, which is very important for photogrammetry. The overall hardware system, that has been designed by Dayton Taylor, allows perfect synchronization at 24 fps. This means that each frame consists of 80 images, and from those images a unique 3D model with a completely new texture has been created using photogrammetry. Performances of the film’s actors have been recorded inside this dome of cameras, which enabled not only to capture their movement, but also their complete volumetric form, skin, face, and clothes - all of the photographic details of the original performance. Capturing Reality, based in Slovakia, has created RealityCapture - new photogrammetry software. It is faster than you expect and it can produce 3D models of unlimited size. Moreover, it is the only software which is able to mix lasers and photos easily without seams and limitations. Capturing Reality is a young company which officially started selling their RealityCapture licenses publicly in February 2016. Digital Air (www.digitalair.com), based in Geneva, Switzerland, and New York, USA, develops and produces visual effects and camera array-related technologies. They provide their camera systems as a visual effects production service on film shoots around the world. Digital Air also license, build and install custom camera systems for events and permanent installations.